EDITOR'S NOTE: The following report was provided by Stratfor, the global intelligence service. Greek anti-terrorism police officer Nektarios Savas was shot and killed June 17 while guarding a state witness in an Athens neighborhood. 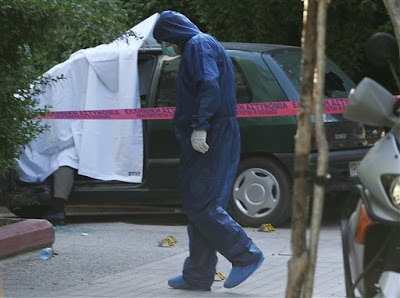 Savas was parked in an unmarked vehicle outside the residence of Sofia Kyriakidou, the wife and key witness in the trial of Angeletos Kanas, a convicted member of a defunct Greek militant group. At 6:20 a.m., shortly after sunrise in Athens, Savas had just gotten coffee and was settling in for his shift when two gunmen approached his vehicle and fired 24 rounds into it, hitting him 18 times and wounding him fatally. The assassins then sped away on motorcycles driven by two other accomplices. Savas was never able to draw his weapon. Although the witness Savas was protecting was in the house at the time of the shooting, the gunmen do not appear to have made any attempt to harm her. Two groups claimed responsibility for the murder, “Revolutionary Sect” and “Rebel Sect,” but groups using slight variations of these names have claimed responsibility for dozens of attacks so far this year. It is very common for militant groups to claim responsibility for attacks using different names to confuse their pursuers. We believe the group behind most of the recent attacks is “Revolutionary Struggle” (EA). EA (its initials in Greek) is thought to be a spinoff from the Greek terrorist group November 17 (N-17) and has been operational since at least October 2003. It shares a similar ideology with N-17, which rejected democracy, capitalism and outside influence in Greece — especially from the United States. EA rejects EU policies in Greece that it claims hurt the working class. EA was very vocal in the run-up to the 2004 Olympics in Athens, carrying out attacks against businesses and the police to protest the high levels of security in the country and the high price tag that came with hosting the games. The murder of Savas and other recent attacks by EA demonstrate that the group is becoming increasingly brazen and aggressive, and comparisons between EA and N-17 reach beyond ideology. EA has used tactics and attacked a target set very much like those of N-17. It is quite possible, then, that we will see EA expand its actions to include attacks similar to those carried out by N-17, which, throughout its long operational history, assassinated not only police officers but also diplomats and industrialists by using small arms at close range. Periodic attacks by anarchists and left-wing militant groups in Greece date back to 1975, when the emerging N-17 shot and killed CIA Station Chief Richard Welch in Athens. In 2009, however, militant attacks have become more frequent and lethal. There have been 16 attacks so far in 2009, compared to 10 in 2008 and 4 in 2007, and Savas was the first casualty linked to EA or similar groups since 2004. He was not the first police officer to have been targeted in recent years. On Jan. 5, 2009, during protests in Athens following the police shooting of a 15-year-old boy in December 2008, gunmen shot and seriously wounded a policeman standing watch outside the Culture Ministry building (EA claimed responsibility). Then on February 3, three gunmen on motorcycles fired on and threw grenades at a police station in an Athens suburb (claimed the next day by a group calling itself the “Sect of Revolutionaries”). And in December 2004, a policeman was shot and killed while guarding a British diplomat by a man believed to be linked to EA. In its early stages, EA typically avoided lethal attacks. The group would place warning calls before detonating an improvised explosive device (IED) and conduct attacks at night when the chances of collateral damage were lower. Their attacks were more the acts of vandals than terrorists. However, in recent years EA has increased its level of violence and has staged attacks that are clearly intended to kill. Due to this escalation, EA has begun to look more like N-17, and its recent attacks appear to be borrowing from N-17’s playbook. N-17 was comprised of a small group of dedicated militants who, over a period of 25 years in the 1970s, ’80s and ’90s, were responsible for assassinating 22 people before being taken down by Greek authorities in June 2002 (the break came when an N-17 member was wounded while attempting to plant an IED). N-17 targeted Greek political offices, police and military installations and vehicles, tax offices and facilities of foreign multinational corporations (MNCs). For targeted assassinations, it employed simple attacks with firearms — a single .45-caliber automatic pistol was linked by ballistics to five different attacks over a 20-year period. But N-17 also used anti-tank rockets (acquired in a raid on an army camp in 1989) and IEDs, which were involved in its attack against the U.S. Embassy in Athens in 1996 and in its 1988 assassination of U.S. Navy Capt. William Nordeen. But N-17’s most lethal tactic was the small-arms attack against foreign diplomats and Greek businessmen as they were entering or exiting their vehicles or as they were stopped in traffic. Its first attack, against Welch, the CIA station chief, occurred outside his home as he was coming back from a Christmas party. In 1983, the head of the U.S. military aid group in Greece, Navy Capt. George Tsantes, was shot and killed while in his vehicle at a traffic light. Greek industrialist Dimitris Angelopoulos was shot outside his home as he was entering his vehicle in April 1986. A number of other cases followed the same script, all the way through to 2000, when British defense attache Brig. Stephen Saunders was shot and killed on his morning commute to the British Embassy by two gunmen on a motorcycle, a get-away vehicle that appears to be as popular with EA as it was with N-17. It is telling that when EA decided to kill officer Savas it opted for the same tactics as its predecessor used: gunmen on motorcycles striking vehicle-borne targets who were following routine schedules. Such attacks adhere to a tried-and-true formula that, while not as dramatic as IEDs and rocket attacks, is very straightforward and embodies a simple, brutal elegance. EA appears to have adopted N-17’s target set as well as its tactics. EA and related groups routinely target foreign MNC facilities such as car dealerships and banks, along with security installations and political offices (such as those of Greece’s leading party, New Democracy, attacked in July 2007). But EA also has a taste, as did N-17, for going after foreign diplomatic targets. In January 2007, EA fired an anti-tank rocket at the U.S. Embassy in Athens, damaging an outside wall. In 2007 and 2008, militants possibly linked to EA detonated a series of improvised incendiary devices made with camping gas canisters under vehicles belonging to Saudi, Turkish, Philippine Italian and Bosnian diplomats. The attacks typically destroyed the cars but caused no physical harm to anyone. While targeting parked diplomatic vehicles with improvised incendiary devices at night posed a minimal threat to people, it did demonstrate that the perpetrators possessed skills that could be employed to more lethal effect. Even low-level attacks like those on the diplomatic cars showed that militants could follow the basic terrorism attack cycle and conduct preoperational surveillance to determine where the cars were parked at night. Then they were able to plan their attacks, acquire the necessary materials, construct their devices and plant them without detection. And if an attacker can determine where a diplomat parks his or her car at night and plan an operation around that, it is not a very large leap to shoot a diplomat walking to a car or sitting inside a car in traffic. Of course, simply identifying a vehicle with diplomatic plates does not automatically mean that the owner is a high-level diplomat. In order to identify a high-value target (HVT) such as a CIA station chief or military attache, additional intelligence would have to be collected. To justify its increasing aggressiveness, EA has used accusations of police brutality stemming from the December 2008 shooting of a youth, but another underlying factor that has led to public unrest in Greece is the global economic crisis, which in Europe is widely blamed on foreign companies and governments. EA and like-minded groups have made it clear that international banks and investment houses are in their crosshairs, as seen in the attempted Feb. 18 IED attack on a Citibank branch in Athens and a successful attack on a Citibank branch the next month. Just as the attack against the U.S. Embassy and diplomatic vehicles demonstrated that foreign diplomats are in EA’s target set, these bank attacks demonstrate that financial executives also could be targeted. No government has the resources to protect everything, and the Greek government is no exception. EA has many targets, which means that Athens cannot possibly protect every foreign diplomat, Greek industrialist and foreign businessman in the country. Because of this, individuals in this target set must begin to practice good personal security habits and increased situational awareness. Special attention should be paid to possible surveillants on motorcycles (especially those wearing helmets that obscure the entire face). N-17 shot several victims from motorcycles as the victims were sitting in their cars in Athens traffic. Assailants would pull up from behind the driver’s window and fire from close range. Potential EA targets should pay close attention to motorcycles approaching them from the rear as they are stopped in traffic. Likewise, companies and governments with people on the ground in Greece should conduct their own proactive security measures to prevent falling victim to an attack. One of the most obvious measures is to institute a countersurveillance (CS) program, since any attack would be preceded by preoperational surveillance of the target. Employing a countersurveillance team will help identify potential surveillants around sensitive targets (such as private residences, offices or commonly used routes) and increase the likelihood of thwarting an attack while it is still in the planning stage. (Such efforts might also produce information that would help the Greek government identify EA operatives.) However, even if a CS operation is not successful at identifying specific operatives, it could, at the very least, make it harder for militants to attack a certain target and encourage them to move on to something less challenging. With attacks escalating in Greece, a militant group apparently taking its cues from N-17, and an economic crisis stirring up social unrest, the level of risk in Greece — especially Athens — is very high. Practicing appropriate security measures will help ensure the safety of HVTs and prevent them from becoming the next media story. The June 17 Savas killing holds a strong lesson for anyone working alone to protect a potential target. This is not as uncommon as it might seem: There are many executive protection teams around the world in both government and private industry that rely on a single officer or agent working to keep a principal safe. And it is not at all uncommon for a lone agent, like Savas, to work long hours posted in front of the principal’s home. During such an operation, it is extremely difficult to remain alert — especially after standing a post for weeks or months without anything happening. It becomes a full-time job merely to remain alert during an entire shift and it is very easy for complacency to set in. This danger is amplified in the age of iPhones, PDAs and laptop computers, devices that make it very easy to become distracted. But lack of situational awareness can be very deadly, even for trained security personnel.